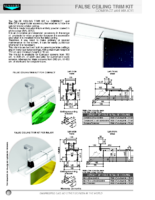 THE FALSE CEILING TRIM KIT FOR COMPACT AND MAJOR is a particular accessory that enables to hide the cabinet inside a false ceiling. This kit is made from aluminium entirely powder coated in white colour (ral 9010). It is an innovative and essential accessory in the range of products for video-projection because it is accessible also when it is installed inside the false ceiling. Therefore, if you need to make ordinary or special maintenance to the screen, it can be easily pulled-out whenever it is necessary. 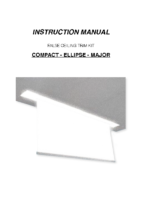 This trim kit can be fixed both in panel-type false ceilings and in fixed-type false ceilings, with a maximum height of 110 cm and minimum height of 12 cm.The trim kit is available for compact screens from 160 cm. to 300 cm. of width and also for customized sizes screens, whereas for major screens from 300 cm. till 450 cm. of width and for bespoke sizes.